T wo same picture at two consecutive posts? No kidding! I just realized that the previous post might gave a teaser about normal radiology appearance of maxilla and mandibula extraorally. There were a lot of arrow indicate several anatomic landmark that sometimes superimposed with another landmark. No wonder! 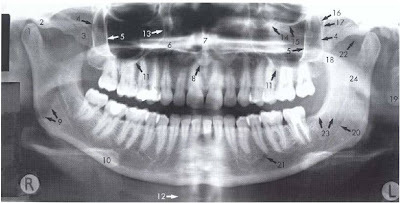 It's all because radiograph is 2D projection of 3D structures. One should understand what normal radiograph looks like before stated that it was abnormal. Please do remember that sometimes we might experience what so called normal variation (which is not an abnormal). Oh, yeah, about the interpretation of the picture above, please continue reading. could you pls post about complication that might occur in dental clinic when treating health problem patients. for example, heart problem patient who are going for an extraction. thanks in advance.